The Lumex bariatric transfer bench from Graham-Field provides assistance to those who have difficulty stepping over bathtub walls. 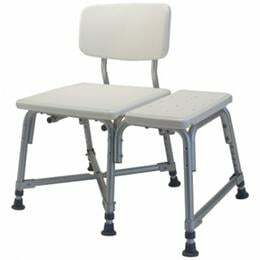 With its durable blow-molded plastic bench and backrest and 600 lb. weight capacity, the bench is ideal for bariatric users. For additional product information, including a larger picture and further specifications and features, click on the Product Detail PDF located below, under the Additional Resources tab. Seat height adjustment range: 16" - 20"
Clearance beneath frame (varies by seat height): 14" - 18"